As the first in Hong Kong to introduce the revolutionary concept of play-based learning, Yew Chung has always been synonymous with high quality education in Hong Kong, and an expert in Early Childhood Education (ECE). As a part of its dedicated efforts to promote quality play-based learning, Yew Chung College of Early Childhood Education (YCCECE) is proud to host the public seminar “Play to Learn – the Key to Early Childhood Education” on 22nd January, fostering a dialogue and exploring ECE topics with local educators and parents. 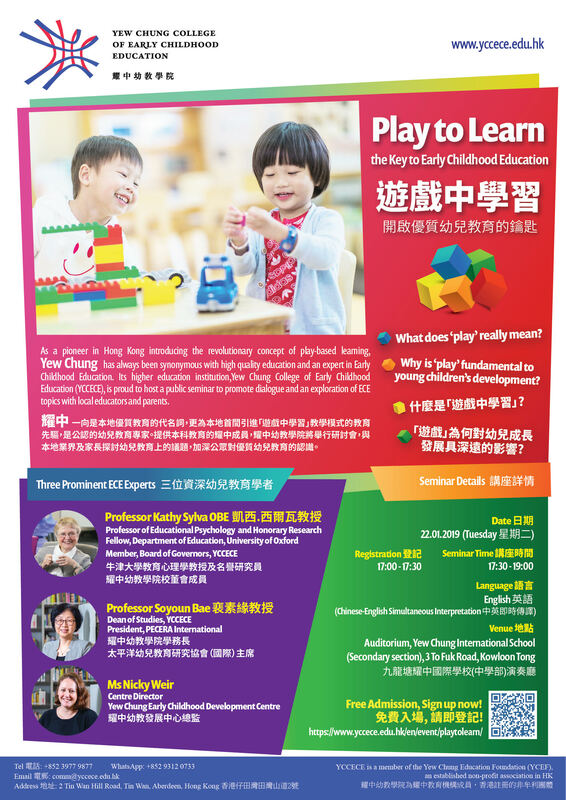 Three prominent ECE experts including Professor Kathy Sylva, Professor Soyoun Bae, and Ms Nicky Weir, will be sharing their invaluable experiences and insights on what ‘play’ really means and how it is fundamental to young children’s development.